V838 Mon: Video of a stellar outburst. 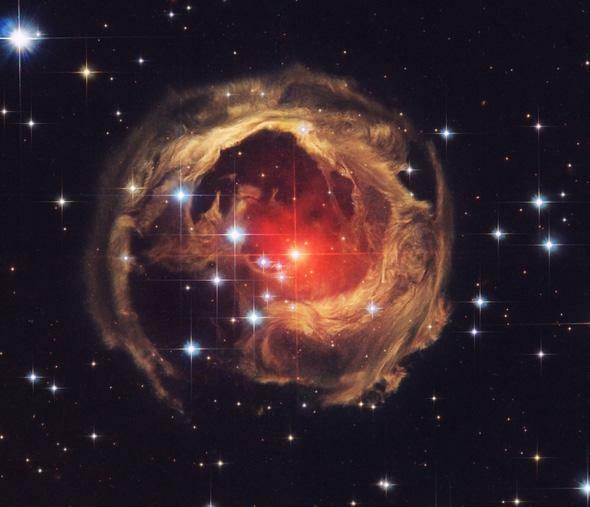 The art of the heavens: Hubble image of V838 Monocerotis, which underwent a vast explosion a few years ago. Every now and again, something old on the ‘Net is rediscovered and gets a bump in popularity for a time. I think this is a good thing, especially when it’s something astronomical. I got a few notes from people yesterday alerting me to a video of V838 Monocerotis, a beautiful and frankly bizarre star that underwent a huge outburst a few years ago. Hubble images of the event show that the star is surrounded by a huge cloud of dust tens of trillions of kilometers across. Over the years, many images were made, and the shape of the cloud appears to change. The video shows this in an animation created from these Hubble observations. Cool, eh? But there are a couple of things I want to point out. First, despite appearances, the cloud itself is not changing in these images! It’s actually fairly static, with movement far too small to notice on this timescale. What you’re seeing is actually a pulse of light from the outburst moving through the cloud, illuminating it. Light moves very rapidly, but the cloud is huge, light years across. That means it takes a long time for light to cross it, and over the years we’re just seeing different parts of the dust cloud lit. This type of event is common in astronomy, and it’s called a light echo. Second, although we’re not exactly sure what caused the outburst, the most likely explanation is that two normal (but massive) stars merged together. An event like this is pretty rare, but entirely possible. When that happens they form a single, more massive star, which is unstable. It can undergo a huge paroxysm, brightening by a factor of thousands, and also expand and redden. This all fits what we see here; the dust cloud would’ve been part of the nebula that formed the stars, and existed long before they did. I’ve written about V838 Mon before, and you can get a lot more details there. This object is pretty weird, and pretty pretty. The video came out in 2011, but it got picked up yesterday by Gizmodo and then again by IFLS. That’s fine with me! Astronomy is cool, and beautiful, and amazing, and as far as I’m concerned the more people who see it—old and new—the better.